I’ve talked in earlier articles about the value of the writer/artist package to a record company. One of the primary advantages is that it’s easier, for the writer/artist to establish a consistent stylistic identity because he/she is writing about themselves and maintains a point of view in the songs that helps us, as listeners, to get to know and identify with them. Good examples are Randy Newman, Joni Mitchell, Jackson Browne and Tom Waits. The record company can also be confident that their writer/artists will save them and the producer the trouble of looking for appropriate material, a very important but tedious task. There are exceptions to this, of course, and more and more writer/ artists are open for “outside” songs (songs not written by the artist.) The reason is that the artist needs tunes the record company feels are potential hits and the artist in question may not have written anything that comes close. 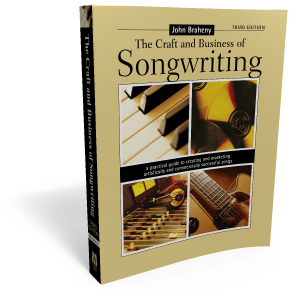 Another reason for the value of the writer/artist package is the possibility that the record company can also negotiate for the publish-ing rights to the writer/artist’s songs, and thus get a substantially greater return on their investment. However, in our interviews with record company A&R people, the consus is that they’ll sign an artist they believe in even if they can’t get a piece of the publishing. So, if you’re not a writer, why can’t you go to record companies with your versions of current Top 40 songs? Well, those songs are al-ready hits by other artists and the chances that your recording of one of those tunes could be a hit is very slim. One thing that might work would be to do a country version of a pop hit, and vice versa. In other words, appeal to a new audience with a song that was popular with another bag. I Will Survive and Reunited are two examples of recent R&B/pop hits covered succ-essfully by country artists. What about doing an oldie? Maybe, if you find one that you can do exceptionally well and nobody else has recorded for ten years or so. Ronstadt has been successful with this approach because her older audience not only likes the way she sings, but because oldies trigger those old backseat first love memories. Her younger audience, who don’t remember the songs, like them because they’re basically good songs and they dig anything she sings. Remember, though, that she became a hit artist on the strength of original songs like Diff-erent Drum and Gary white’s Long, Long Time. So why do you need originals? Record companies put a lot of bread into making the world aware of a new artist. The cost of recording and promoting a new artist can be as much as $250,000. They want to establish a unique and individual image that makes the artist stand out from the field. If you get there with a song that’s identified with someone else, it interferes with that special focus. It also invites a comparison that you won’t hold up no matter how well or uniquely you perform the song. Chances are that we’ve heard the original hit version hundreds of times and it’s provided the background for lots of memor-able experiences. We love it best. It’s tough enough for a record company to break a new artist without dealing with that kind of resistance. So, what kind of songs do you need? You’re a singer and you don’t write. You want to try to get a record deal. You think you have a special style. You also need to estalbish an identity in the style of the music and in the lyric content that expresses where you’re at as a person. You also have to be very aware of the commercial potential of songs. Record companies want to hear hits on your demo reel. They’d like to know that you can choose songs for yourself that represent a consistency of style and hit potent-ial. Sure, that’s what your producer will do, and also what the A&R department at record companies should do for you but assume they’re either busy or lazy and at this point they’d rather look for great songs for their established artists. You’re on the outside look-ing in and you’re not their priority. It’s up to you. ln the next edition of Music Connection, John Braheny will examine sources non-writing artists can turn to for material.